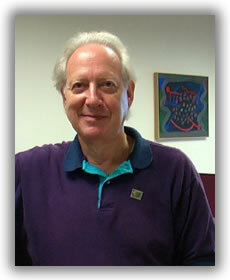 Dan Morgenstern turns 85 on Friday, October 24. But we celebrate him every day. I know I have learned so much from reading his quiet, straightforward prose (I can recite passages from his Louis liner notes, his Hot Lips Page ones, and a hundred more), his magazine articles and Mosaic notes, his voice coming through the radio (“Jazz From the Archives” on WBGO-FM), and in person. He’s been generous to me and thousands of other researchers in his time at Rutgers, and his generosity didn’t stop when he retired. He is a model of perception, and his range is never limited. If it’s good, you’ll find him in the audience. Yes, he is a link to the past (ask about naby hallowed musicians from 1947 onwards and he saw them and sometimes spoke with them) but he is also very much living in the present, someone who is excited about the gig he went to last night — not an elder who thinks all the glories are gone. You will have two special opportunities to celebrate Dan, and to celebrate with Dan, this week. On Wednesday, David Ostwald and the Louis Armstrong Eternity Band (that Birdland perennial) will be celebrating Dan with one of their special late-afternoon / early evening gigs. The musicians David has lined up for this celebration include Bjorn Ingelstam, Adrian Cunningham, Marion Felder, and Vince Giordano — but I’m sure that other notables will be in the house and on the stand to celebrate Dan. 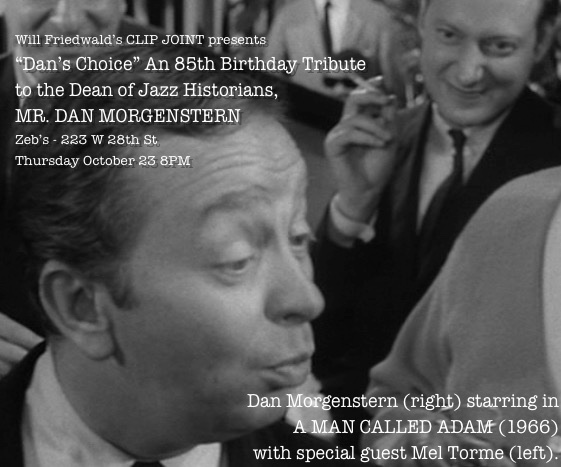 On Thursday, Will Friedwald is hosting one of his inimitable CLIP JOINT presentations of video performances that Dan has picked out himself as well as a few surprises . . .
To reserve your seat, RSVP to Levis4402@yahoo.com — it’s $10 to join in. I know both of these events will sell out, so make your reservations early so you aren’t left on the sidewalk. And if you can’t make either one, a simple, “Mister Morgenstern, happy birthday and thanks so much!” will do when you encounter Dan at a gig. There are the great artists — such as Louis Armstrong — without whom our lives would be incomplete. But there are other great artists who make so much possible. They don’t play or sing. And they are always loved by the people in the know — but they aren’t always brought to the forefront, aren’t always celebrated for their remarkable imaginations, ingenuity, and love. One such man is George Avakian, now 95, who has done so much for jazz since 1939 or 1940 up to the present day. We are grateful than people like Mister Avakian exist. He has increased our happiness in so many ways. And JAZZ LIVES readers know how much we owe to Young(er) Masters Riccardi and Ostwald. For more information on George Avakian, see here. But I think that birthdays are a good thing. The Beloved had one recently, and it was very sweet. And — after all — isn’t it just our way of saying, “We are SO glad you are here?” Who could argue with those sentiments? So I want to let everyone know that this coming Wednesday, David Ostwald and the Louis Armstrong Centennial Band will be celebrating Dan Morgenstern’s eighty-third birthday in the best way . . . by playing hot jazz for him at Birdland from 5:30 to 7:15 PM. The participants? Bria Skonberg, trumpet (and no doubt vocals); Dan Block, clarinet and alto sax; Jim Fryer, trombone (ditto the above); James Chirillo, banjo; David Ostwald, tuba and commentary; Marion Felder, drums. And I’ll bet a blue-label sunburst Decca of THANKS A MILLION that there will be other musicians in the house who want to make their love for Dan public and resonant. If you have to ask who Dan Morgenstern is, I don’t think you’ve been taking careful notes: scholar, lover of all sorts of good music, archivist, writer . . . and friend of the best. His liner notes educated so many of us and pointed us in the right directions, and he keeps on keeping on. Birdland is at 315 West 44th Street and my guess is that the room will be full — so call 212.581.3080 to make sure there’s a place for you. That was one example from Mr. Barrett’s 2011 swing through town — aided and abetted by Matt Munisteri, guitar; Joel Forbes, string bass; Scott Robinson, reeds and jazzophone, and Scott’s brother David on cornet. The good news is that Dan is coming to New York for another swing sojourn. Here are a few of the details — provided by The Man Himself. Sunday, 23: Dan arrives late evening. Tues 2: more recording as above (10am-4pm); then Dan subs for Jon-Erik Kellso (on trumpet) with Vince Giordano’s Nighthawks at “Club Cache'” (downstairs at Sofia’s Restaurant, at the Edison Hotel); (8-11pm). More recording on Wed 3 and on Thurs 4: Dan flies home. Californians have opportunities to enjoy Dan’s trombone / cornet / piano / vocals / arrangements — but his New York visits are once-a-year. So mark off some time on the jazz calendar! By the way, Dan will be in western New York from September 16 to the 23 — as a charter member of the first Traditional Jazz Workshop at Chautauqua, and then as a c.m. of Jazz at Chautauqua itself.